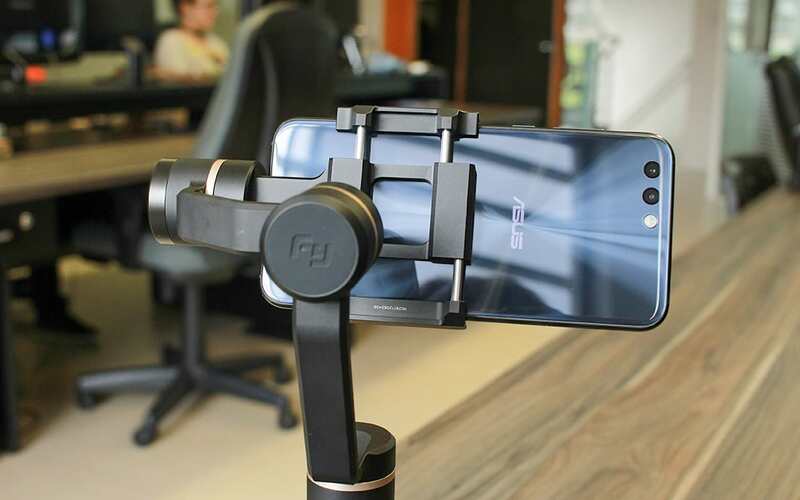 We received from the Tomtop.com store a gimbal for smartphones. 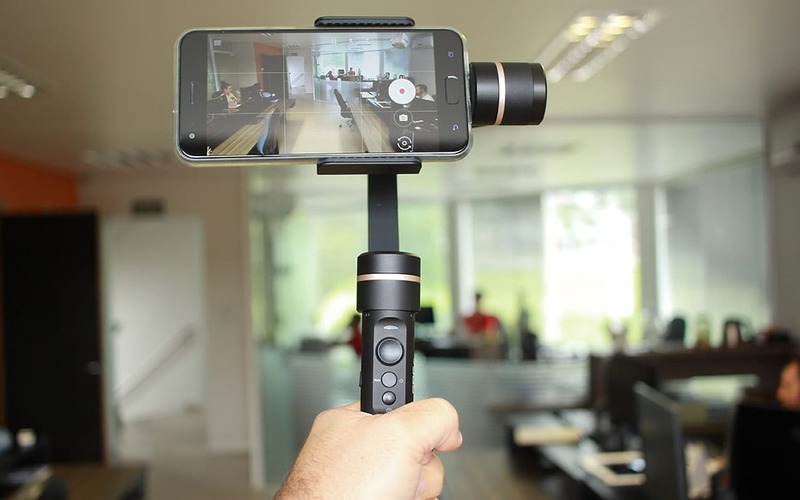 For those who do not know what a gimbal is, it is an image stabilizer, it serves to make videos in motion with more smoothness between scenes. 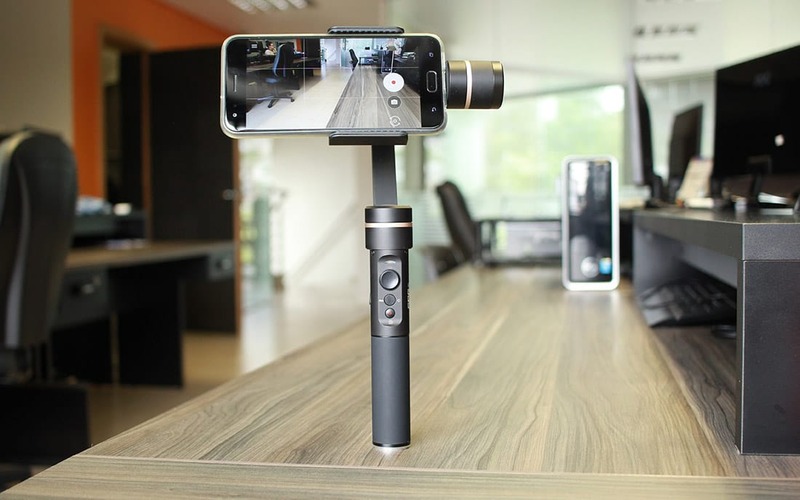 Who has not seen it yet, we have received another Gimbal for testing, the WenPod, review here. Unlike the WenPod, the FY SPG comes with three image stabilization axes, with this third axis, the movements under the main axis facilitate smoothing and allow us to make 360º images. 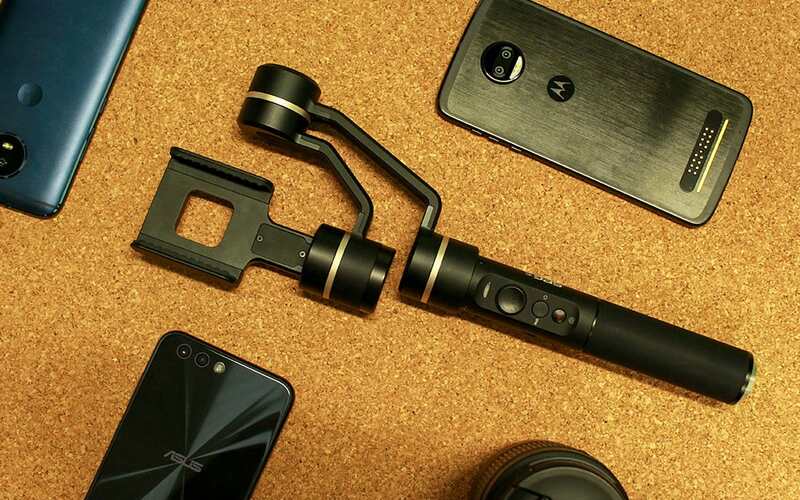 Surely if you are looking for a gimbal to make better videos with your smartphone, buy one with three axes. SPG will help and much of the Net’s Workshop to make better videos on event coverage and reviews by testing the cameras as well as takes for the main video. The SPG is equipped with three axes, automated and controlled by a control unit that emits a force proportional to the action of movement caused by the user, it is this control that makes the image practically static. It features bluetooth connectivity, running similar to a selfie bat. You need the App installed on your smartphone to open control options. The 3000 mAh battery can be recharged by a traditional microphone USB smartphone cable that comes with the kit. The charging time varies from 2 to 2:30 hours, and it can record around 4 intermittent hours or 8 hours in constant use. I’d say it’s more than enough to create good content. Joystick: This, as the name says, is a button to control movement. In addition to stabilization, you can move the gimbal in vertical and horizontal orientations. 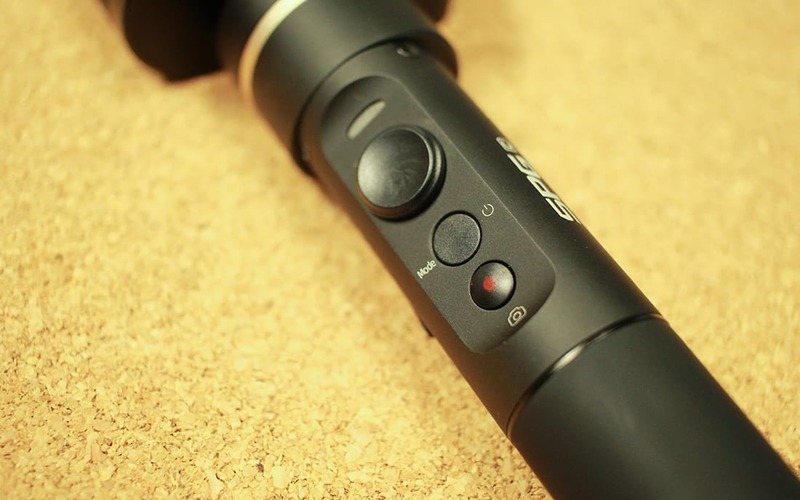 Photo Button: As it has bluetooth connection capability, this button serves as the click of the photo as well as a selfie stick. Trigger: This button in conjunction with the mode button opens options for controlling the phone’s camera, such as the focal length. The software developed by FeiyuTech is something that could be improved, I say this in terms of compatibility. I’d rather use the traditional smartphone camera app, not third-party software to control the camera. After all, when a smartphone is made where the software was also created, the manufacturer is concerned with integrating the camera hardware and software as closely as possible. The Feiyu app was created to fit any camera sensor, so it should not be better than the native app. Well, apart from that, it has a lot of integration with the gimbal, like zoom by trigger, shoot and record button. One touch: Panning mode, wide mode. Press again to pause. His configuration is very simple. Incidentally if you do not want to use the app, it is not necessary. However, it will lose some utilities such as the trigger and photo button, which with three smartphones we tested, in the original apps did not work. It works only with the FY app. But, the motion control of the joystick is preserved, after all it’s straight into the gimbal. To set up, you first need to install the battery. The SPG comes dismantled in its box. Simply put the battery, close and it is ready to turn on. Now place the smartphone in the adapter, it is similar to the selfie stick adapters, pull the rods and place the smartphone. This part is the most complicated, for a better gimbal performance, it needs to be as stabilized as possible, so it can use less engines. When placing your smartphone, leave it standing on a flat surface, your smartphone can not hang anywhere. If you lean to the left, move it minimally to the right, causing the gimbal to balance the smartphone without being turned on. This is your main task when setting up. To see the setting, watch the video at the beginning of the post. The FY SPG C is a gimbal with great cost / benefit. It works great, allows you to make really smooth images that will leave your video in a more professional tone. What I did not like was the use of camera integrated with the buttons only in the FY app camera. Although it uses the same sensor as the original smartphone app, it has been built and implemented to work with the sensor, since the FY app interprets the sensor as a standard, not taking full advantage of the camera. But if you, like me, will use it just to stabilize the image with another app, well, then it is very worth buying the FY SPG C, your images do not even compare to the smartphone in a selfie stick or even in hand. I really liked the 360 ​​degree mode where he does an automatic mini lapse time, just leave the gimbal positioned on a flat surface that he will automatically pan the site. To buy it, go to the TOMTOP store , which was our partner who sent the product and made the review possible. Use the ” LSRBR“and get a 10 dollar discount.The store is safe to buy, just like GearBest or DX.Reminding that purchases in China, there is possibility of being taxed at the Post Office, making the price a little more expensive, you still have to tell that if the product but since imports have become more frequent and increasing in the last few years, I see no reason not to import, since the product can not be bought here in Brazil, so if you want a good price product that will make your images more balanced, FY SPG is a great option.